With Trinity the backdrop to countless stories, its legacy will be forever enshrined in Irish literature. In a dusty, post-war Dublin, Sebastian Bullion Dangerfield walked through Trinity’s Front Gate, crossed the cobbled square and ascended the stairs of House Three. This entry into the College, through the over-crowded archway, has been replicated many times since the publication of JP Donleavy’s The Ginger Man, yet the sudden muting of College Green and that awe-struck first glimpse of the Campanile will always remain the same. Speaking to The University Times, Vice-Provost Chris Morash explained the power literature has to capture the prestige of the campus. Trinity, he said, is “a place that manages to feel simultaneously hermetically enclosed and self-referential, and, at the same time, radically open and alert to the world”. 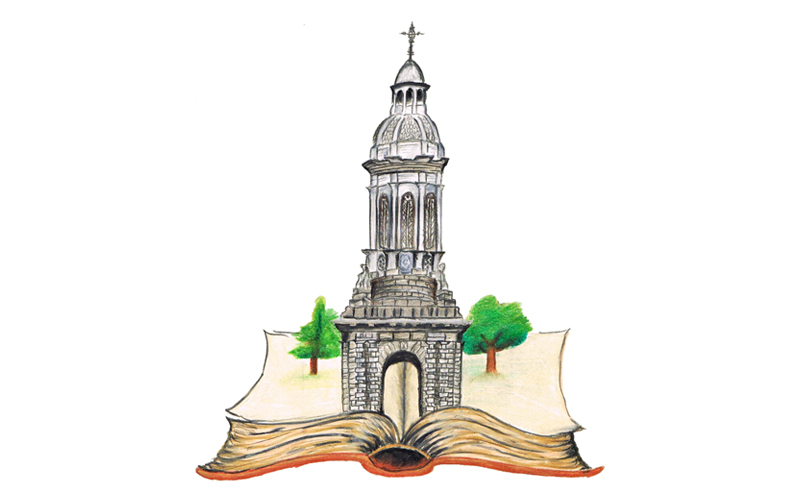 This dual identity of the College and its history is discovered by incoming freshers each year, but also by the authors who value Trinity as a place that nourishes creativity and allows great stories to unfold. In an example far more recent than The Life of John Buncle, Esq, poet Gerald Dawe has brought his fondness for the College to life through the poem “Plinth”, which includes the nostalgic hankering for one’s College days. Dawe’s recollections of “chatter and everlasting laughter” most certainly resonate with anyone who has set foot in Trinity’s Arts Block. It is easy to see how the College has inspired these stories. Barry recalls his own experience as a student, describing his younger self as “rather neurotic, somewhat inept socially, but oftentimes also joyously, outrageously happy… Everything almost happening for the first time. That lends itself to novels”. Remembering the “radiant architecture, wide lawns, the Irish sun with the character of an outlaw, nipping in and out, and endless time, and characterful friends”, Barry recognises that, if nothing else, “the College offers a freshman student four years to read everything and no pressure on you to do anything but find the first inklings of your own voice”. In the eyes of a first-year student, Trinity is, as Barry puts it, a “laboratory of youthful adventure and thought”, and it is easy to see how an author recognises his own potential to be creative when each building and pathway are shrouded in history, culture and imagination. To trace the steps of Oscar Wilde, Samuel Beckett and Jonathan Swift is enough to inspire a sense of awe in most students, and, in rare cases, a novel in others. It is clear from the famous names that attended the College in the past that a precedent has been set for writing in Trinity, and a continuously growing collection of authors have been added to the list. Although somewhat overshadowed by Donleavy’s iconic exposés on life at Trinity in The Ginger Man and The Beastly Beatitudes of Balthazar B, the community of writers that the College has fostered over the last hundred years has grown in size and prestige. With the popularity of the writer fellowship programme in the Oscar Wilde Centre in Trinity, and the optional creative writing module in the final year of English studies, Trinity has maintained a steady flow of graduates who are keen to document their experiences as students of the College. In an email statement to The University Times, author of The First Verse Barry McCrea ponders whether it is possible to ignore the place in which one lives out an “intense” part of their lives when writing a novel, considering the College as a place that is characterised by “feelings and fantasies” that cannot be ignored in the creative process. With an exterior steeped in history, students are contained in a Trinity of the past, yet with an awareness of their ability to carve out their own future and choose which side of Trinity they want to experience. As Barry beautifully puts it, studying at Trinity is “a wild privilege… a privilege that does not, cannot come again”. The many unique takes on time spent in the same university that have been published in recent years is a testament to just how different the college experience can be for each person. Although Claire Kilroy’s magnificent novel All Names Have Been Changed, set in Trinity in the 1980s, and Belinda McKeon’s Tender, which recalls the College in the following decade, differ in their plots, the iconic Trinity architecture, and the feelings it evokes, remains unchanged. In more recent years, Sally Rooney’s writing puts the Trinity of today on a similar level of acclaim as the College Donleavy wrote of in the 1950s. Following on from Conversations with Friends, published in 2017, Rooney’s second novel, Normal People, focuses on Marianne and Connell as they take their first steps into adulthood as first-year students at Trinity, while offering an insight into the complexities of human relationships, class divisions and gender. Longlisted for this year’s Man Booker, and with plans for a BBC adaptation directed by fellow Trinity graduate Lenny Abrahamson, Rooney’s use of the College as a setting has proved extremely popular with her readership, or, as Barry puts it, “Sally Rooney is about to make Trinity the number one college of choice in the dreams of students”. While Donleavy eternalised the Trinity of the past, the ever-changing Irish literary scene affords writers like Rooney and Kilroy the opportunity to revitalise the College’s profile in literature, and put the modernised version of Trinity on the literary map. In the words of the Vice-Provost, starting as a freshman in Trinity is akin to “entering a strange new world, a place in which selves are remade and perspectives on the world shift seismically”, and, if there is one lesson to be learned from the extensive list of novels that tell the story of this College and its many inhabitants, it is to make the most of the Trinity experience while embracing your fellow bewildered students. You never know – you might feature in their novel some day.